A highly detailed premium motion statue straight out of your dreams, or your worst nightmares! 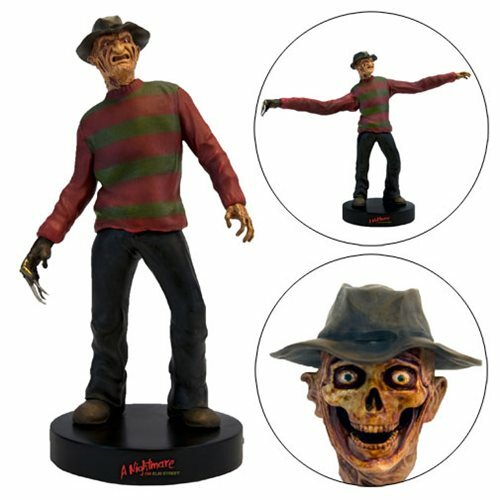 The Nightmare On Elm Street Freddy Krueger Premium Motion Statue is must have for horror fans. Freddy Krueger comes to life in this limited edition hand-painted statue. He comes closer to terrifying collectors to death with interchangeable magnetically connected extremities which feature regular posed arms, the iconic stretched out arms as seen in the alley scene, a traditional head and the ever-classic skull as seen when Freddy rips his face right off of his head! If that wasn't enough to keep you awake at night, the statue also features 9 digitally mastered sound effects and pieces of dialogue sourced directly from the Nightmare On Elm Street movie! Measures about 10-inches tall x 6-inches wide x 6-inches long. Includes 3x "LR44" button batteries.